Thunderstorms this evening, then skies turning partly cloudy after midnight. Low 53F. Winds W at 5 to 10 mph. Chance of rain 80%..
Thunderstorms this evening, then skies turning partly cloudy after midnight. Low 53F. Winds W at 5 to 10 mph. Chance of rain 80%. Fred Wardecker, owner of Wardecker's Menswear Store, 32 North Hanover Street, Carlisle, shows his collection of historical Carlisle photographs which include rare pictures of Jim Thorpe and other items that he displays at his shop. 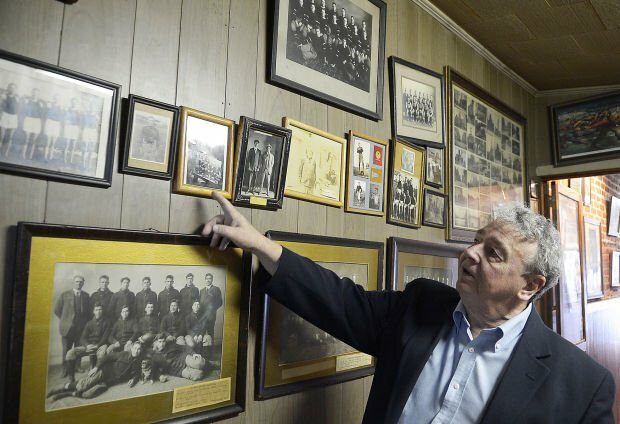 Fred Wardecker, owner of Wardecker's Menswear Store, 32 North Hanover Street, Carlisle, owns a collection of historical Carlisle photographs which include rare pictures of Jim Thorpe and other items that he displays at his shop. Fred Wardecker, owner of Wardecker's Menswear Store, 32 North Hanover Street, Carlisle, shows his collection of historical Carlisle photographs and other items that he displays at his shop. CARLISLE — Bob Wheeler knew just where to go the day he rolled into Carlisle on a bus carrying a suitcase and a reel-to-reel tape recorder. “Anyone researching Jim Thorpe would have heard about Wardecker’s,” said Wheeler, who wrote the definitive biography on the sports legend. A master’s student working on his thesis at the time, Wheeler entered the menswear store at 32 N. Hanover St., and was greeted soon after by James Wardecker. James asked his son, Fred, to take the next few days off so he could show Wheeler around to local residents who had firsthand knowledge of Thorpe and coach Pop Warner from back in the heyday of the Carlisle Indian School football team. Time was precious, and Wheeler needed transportation. 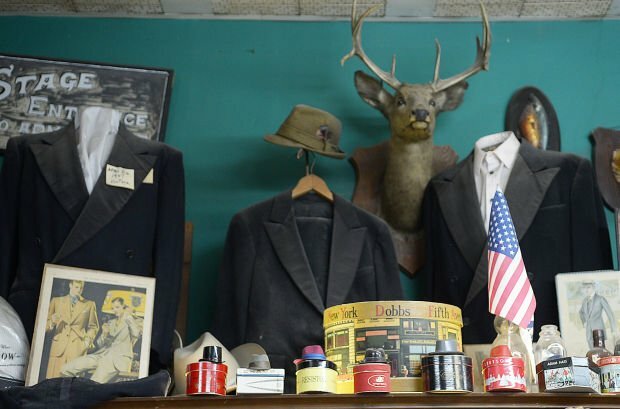 For decades, this menswear store and custom tailor shop has been an important resource for scholars and curiosity-seekers looking for insight into Thorpe and the Carlisle Indian School. Among the items on display are photographs of the athlete, along with movie posters from “Jim Thorpe: All-American,” which had its world premiere in Carlisle. There are also shoes worn by the football players, a ledger recording student clothing purchases and an old school pennant ESPN once borrowed for use in a Jim Thorpe documentary. Situated on the walls and atop a layer of shelves that ring the sales area is a collection of artifacts that form a patchwork of local history. The common thread running through the whole store is the legacy of the father and son. If the clothing purchase exceeded the dollar value of the voucher, the student would pay the difference, Benjey said. Over the years, Blumenthal befriended many of the students and staff, including Jim Thorpe and Pop Warner. The school closed in 1917. About 25 years later, James Wardecker became a sales clerk at Blumenthals early in World War II. He remained an employee until about 1964 when he bought out the business. It was about a year later that Fred started to work for his father. Over time, father and son collected the treasure trove of memories and memorabilia that have made the family business such a valuable resource. When James died in February 1998, Fred took over and became the caretaker of both the artifacts and stories surrounding Thorpe and the Indian School. Authors have visited the store and included some of the stories in their books. For example, Coach Warner once devised a play where the football was snapped to the quarterback who then hid the pigskin in a pocket sewn by Blumenthals into the back of the center’s uniform. While the opposing team went after the quarterback, the center charged down the field and made the touchdown, Wardecker said. That play was later outlawed. In another story, the legendary coach once visited Carlisle and explained to local businessmen how Thorpe had the uncanny ability to drop kick a football through the goal posts from the 50-yard line, Wardecker said. Over the years, James and Fred Wardecker have purchased hundreds of antiques from auctions, yard sales and private individuals. Other items were just given to them for safekeeping or exchanged in trade for merchandise. Most items in the shop collection have a connection to Carlisle and its residents. It was the practice of James Wardecker never to take advantage of someone’s generosity. One day, a man came into the store and offered James Wardecker a genuine team sweater worn by Jim Thorpe. Sure enough, a Jim Thorpe team sweater sold at an auction for $390,000 two to three years ago. “That should have been my retirement,” Fred joked. Decades after Wheeler completed his biography on Jim Thorpe, he visited Fred Wardecker at the store and purchased a suit from his old mentor. For much of his work as a tailor, Wardecker uses a 1938 Singer sewing machine handed down from his grandmother.